To understand the disaster that is present-day economics, it is crucial to recognize that we are living today, not only in the deepest economic crisis/stagnation since the Great Depression, but also—as Paul Krugman declared in his New York Times blog on January 27, 2009—in “A Dark Age of Macroeconomics,” in which the central discoveries of the 1930s have been forgotten or discarded. “What made the Dark Ages dark,” Krugman wrote, “was the fact that so much knowledge had been lost, that so much known to the Greeks and Romans had been forgotten by the barbarian kingdoms that followed.” The critical knowledge lost that gave rise to the new Dark Age in Macroeconomics, he claimed, was none other than the Keynesian Revolution centered on the critique of Say’s Law, or the notion that supply creates its own demand. In the context of arguing against government deficit spending, leading economists at the University of Chicago, the bastion of reaction in economics, have reverted to a “pure Say’s Law, pure ‘Treasury view’” by insisting that increased savings automatically lead to increased investment, while government borrowing invariably “crowds out” investment. Prior to Keynes, the critique of Say’s Law—as Keynes himself observed in The General Theory of Employment, Interest and Money—existed only “furtively, below the surface, in the underworlds of Karl Marx, Silvio Gesell or Major Douglas” (32). Marx dismissed Say’s Law as “childish babble” (Theories of Surplus Value, part 2, 502) but went on to challenge it thoroughly. Keynes brought this “furtive” critique to the surface and made it the basis of all modern macroeconomics. He thereby demonstrated that (1) the economy did not automatically equilibrate at full employment; (2) it was possible for intended savings to exceed actual investment; and (3) it was necessary for government to increase its spending to pick up the slack. In this way, he was able to overturn the orthodox economic view that the state could play no useful role in combating unemployment. Nevertheless, in recent years Krugman has proven himself rare among today’s mainstream economists in being able to learn from historical developments. As explained in a “profile” in the March 2010 New Yorker, he was startled by the Japanese stagnation of the 1990s and by the Asian crisis of the late 1990s, and began to write about “the return of depression economics.” However, it took the present economic disaster arising in the United States and Europe to wake him up fully. In 2008, at the very moment that he became a member of the “Nobelity” (receiving the Bank of Sweden’s Nobel Memorial Prize in Economic Sciences for his previous work on behalf of the establishment), he appears to have become alarmed by the Return of the Bourbons for the first time. The truth is that economics, for all its usefulness, has long since metamorphosed into a corrupted science of a corrupted society. Marx described economists as “the scientific representatives of bourgeois production” and argued that “splendid tournaments” were held in the 1820s and 1830s on behalf of one scientific proposition or another. But once the bourgeoisie took full power, this science was compromised. “It was therefore no longer a question [for political economy] whether this or that theorem was true, but whether it was useful to capital or harmful, expedient or inexpedient, in accordance with police regulations or contrary to them. In place of disinterested inquirers there stepped hired prize-fighters; in place of genuine scientific research, the bad conscience and evil intent of apologetics” (The Poverty of Philosophy, chapter 2, “Seventh Observation”; Capital, postface to the second edition). From this perspective, it is hardly surprising that the dominant schools of economics have discarded whatever remained of genuine inquiry whenever it seemed to conflict with ruling capitalist class interests. Those interests have to do, of course, with profits and wealth (that is, the rise of asset values) and not with the state of the economy as a whole—certainly not the condition of the poor. When the banking system was in outright crisis in 2007-2009 and a meltdown of the entire financial system was at issue, the vested interests were fairly unanimous in backing government bailouts and a government stimulus. Yet, once the “recovery” started, and profits and asset values began to rise again, the goal for those at the top—and for their hired prizefighters in the economics profession—turned to preventing any lasting growth of government spending, especially if benefitting those at the bottom. 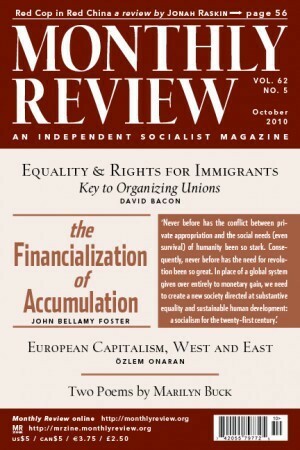 The fact that finance now so dominates the economy (see this month’s Review of the Month) means that the revival of production and employment is viewed as of questionable value from the standpoint of those at the helm of society—if seen as threatening profit margins and financial balance sheets. In this sense, the counterrevolution is complete. The old Keynesian economics has been completely repudiated by the capitalist class, as no longer in its interest. Say’s Law—however illogical and scientifically disproven—has made its ghostly reappearance under the regime of monopoly-finance capital, as an indispensable ideological tool for promoting the interests of the now dominant fraction of the capitalist class. For all the brilliance of his newfound critique, Krugman is therefore fighting a losing battle. He has failed to recognize that the world has truly changed (and was never quite what he thought to begin with). To be sure, government spending to promote employment has to be strongly supported by the left. But less and less can be accomplished in this respect within the logic of the system. There is no going back to some mythical Keynesian Camelot. Attempts to resurrect what Marx called the “splendid tournaments” of bourgeois economics of old look more and more like Don Quixote tilting at windmills. It is true that we are in a Dark Age of Macroeconomics. But the new barbarian kingdoms are far more insidious than those of the past, and are to be traced not so much to lost knowledge, as to the decline of the empire of capital itself.